Genea-Musings: Amanuensis Monday - 1778 Inventory of Estate of Samuel Haughton (1686-1778) of Eastham, Mass. 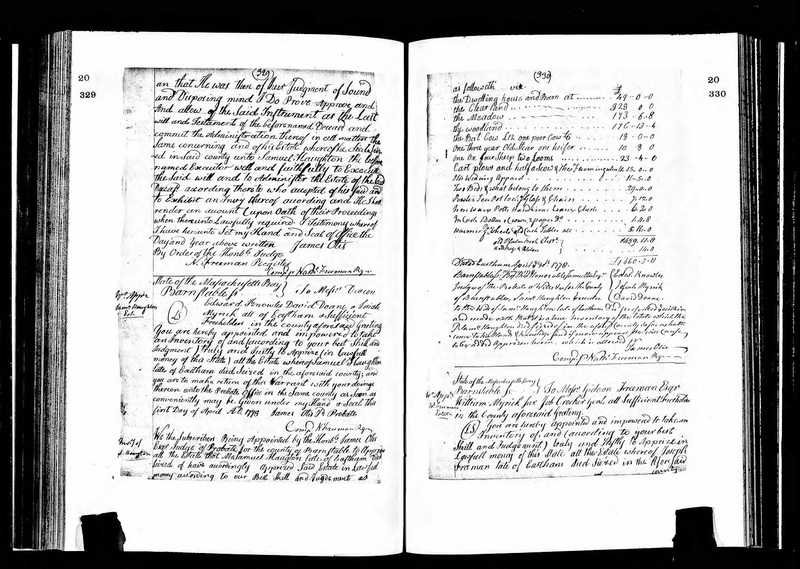 Amanuensis Monday - 1778 Inventory of Estate of Samuel Haughton (1686-1778) of Eastham, Mass. Free holders in the county aforesaid Greeting. to be added Apprizers herein, which is allowed. "Massachusetts, Wills and Probate Records, 1635-1991," indexed database with digital images, Ancestry.com (http://www.ancestry.com, accessed 14 December 2017), Barnstable County > Probate and Guardianship Records, Volumes 17-20, 1769-1809, Volume 20, pages 329-330, Samuel Haughton inventory, taken 30 April 1778. Samuel Haughton (1686-1778) (also called Samuel Horton in several records) married Hannah Atwood (1686-1771) in 1714 in Eastham, Massachusetts, and they had eight children, all of whose births were recorded in the Eastham town records with the surname Horton. In his will, Samuel Haughton gave all of his real estate, his wearing apparel and his farmer's utensils to his only living son, Samuel Haughton, and his gun to his grandson, Cushing Horton. The remainder of the personal estate was to be distributed equally to the heirs of his six deceased children. There are no other probate records available to define the land or the distribution to the heirs. Samuel and Hannah (Atwood) Horton are my 6th great-grandparents, through his son, Nathaniel Horton (1721-1771) who married Eunice Snow in 1742.